A three-metre (10-foot) python has killed a student zookeeper who let the snake out of its enclosure in Venezuela while working a night shift at the zoo. 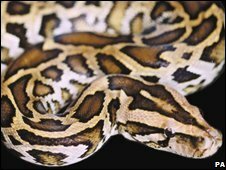 Horrified employees at the Caracas zoo discovered the Burmese Python as it tried to swallow its victim's head, local media reported. The co-workers beat the snake to force it to release Erick Arrieta's body. Marks on the biology student's left wrist suggested the snake had bitten him before crushing him to death. Arrieta, who was 29, had been supervising the reptile section alone on Saturday night when he broke zoo rules by opening the snake's cage, Venezuela's El Universal newspaper quoted zoo officials as saying. The snake was donated to the Caracas zoo two months ago and was not on public display, said the zoo's management in a statement. "The young man underestimated the animal's instinct," said Javier Hernandez, director general of the Parque del Este zoo.